We are women who strive to grow as Christians while walking in the faith of Christ. Faith Walker's mission is to be mentors to all women while sharing the gospel of Jesus Christ. To further reach out and support women in our local community and to provide support for women & children of foreign missions. Our ministry is open to all women. He whispered, "My precious child, I love you and will never leave you, Never, ever, during your trials and testings. 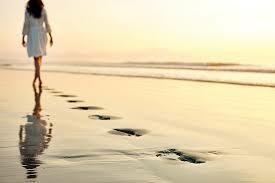 When you saw only one set of footprints,It was then that I carried you."